In order to save visual space in the Xsheet view, columns can be hidden from view. The hidden layer's presence is indicated by a thicker grey line between columns. 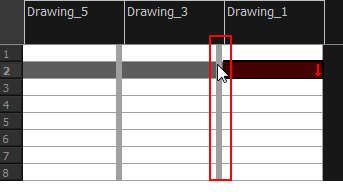 Click the thick grey line that represents a hidden column. Right-click on the column header and select Show Hidden Columns. Press Alt + Shift + H.
Click Check to select all the selected columns. 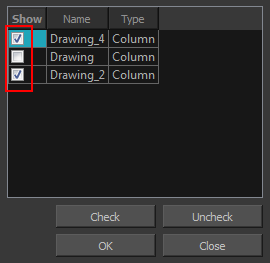 Click Uncheck to deselect all selected columns.